Pergola on the Roof, the rooftop pop-up on the roof of the carpart at the old BBC Television Centre in Shepherd's Bush / White City, was a bit hit in the summer, and has now opened for the winter, with heating, to open Wednesday to Sunday until 23rd December 2016. The four restaurants on the rooftop are Snaps & Rye (Danish), Patty & Bun (Burgers), Le Bab (Gourmet Kebabs), and Gunpowder (Indian) so there is definitely something for everyone. "How are we making our rooftop British winter weather proof? We’ll be fully covered by a dome, that’s heated, wind proof, water proof and snow proof – you name it, we’ve proofed it! Our tree walkways into the Pergola will be covered too, so from the minute you arrive outside the building you are warm and dry! Winter is Coming…And So Are We…. Pergola On The Roof is coming back! 92,000 of you entered our Mediterranean haven, surpassing all expectations of how much you would love our sunny pergola. So…. This winter we’re back, with a bang! 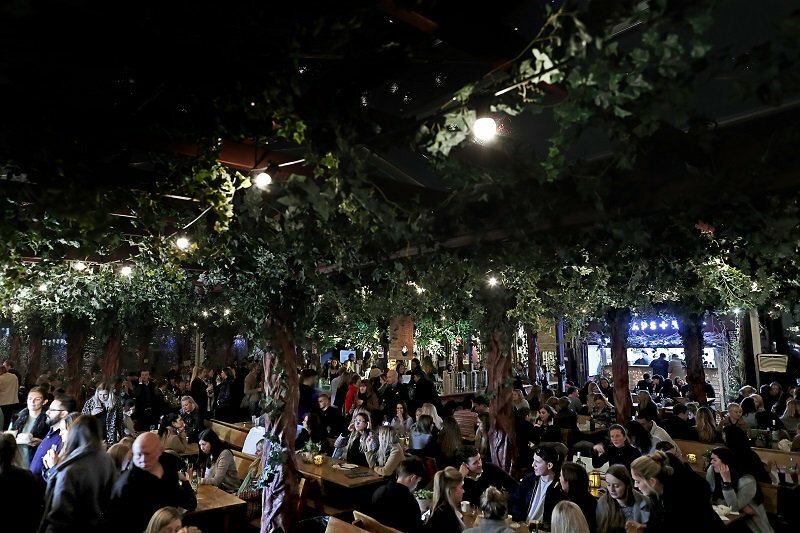 Opening on November 3rd we’re transporting you into a Nordic-mystical forest dining scene, set 100-feet-high under a canopy of holly, ivy, and winter flowers and filled with some of London’s finest restaurants. Pergola on the Roof will be a piece of wintry escapism – a rooftop eatery, covered by a low level wooden structure wrapped in forestry foliage, set against burgundy walls and paved with woody bark. Think silver birch trees, low level lighting, blankets, cedar wood, oaky scents and candle light. Same rules apply as the summer, 600 seats, 4 restaurants, 2 bars, 5 day beds, and a whole heap of fun!"